[0:01] <ParkerR> All the exports? [0:07] <ShiftPlusOne> djazz, any luck with rpi-update? [0:17] <djazz> ShiftPlusOne: found this: "However, apparently there is an issue with the newest build that breaks sound. Edit the `_gitref` and set it to `b0143ac0`, the last known good commit." [0:19] <l_r> does the camera module work well? [0:20] <l_r> are they working on it? [0:21] <l_r> djazz, what's the highest resolution available? [0:22] <l_r> is raspberrypi fast enough? [0:30] <Phosie> My router is so slow to restart, IRC will certainly disconnect. [2:13] <Dakota> ozzzy, People need to make money. [2:14] <[Saint]> A huge amount of people capitalized on the uneducated and plateres "for raspberry pi" on <various_objects> and added ~100% to the price. [2:14] <[Saint]> ...its disgusting, but, its life. [2:14] <Dakota> Allot of things especially things like iphone cables, and iphone Digi/lcd kits can be fou nd a dx.com for great prices. [2:14] <[Saint]> dx is very hit and miss, though. [2:15] <Dakota> It is, like anything from china though. [2:16] <[Saint]> Other nations make terrible products too, y'know. [2:16] <Dakota> For higher prices. [2:17] <Dakota> I got these moody tools precision drivers, and for awhile they had very bad QC control. [2:18] <Dakota> But its much better now. Ever since they got the apple contract to make the only official pentolope drivers. It seems QC has really improved. [2:20] <Dakota> Is OT allowed here? [2:22] <Dakota> Well I would kill you for a mcdonals cheezburger at the moment. [2:38] <diginet> hello! does the Raspberry Pi I2S interface support 24/192? [3:07] <[Saint]> FergyA: That's a 'lil bit of awesome to start me day with. [3:09] <n3hxs> Cool vid of the rocket trip. [3:10] <[Saint]> Ah. I was just going to ask if it was recorded from the ground as well. [3:13] <bity> "this thing runs on python..."
[3:13] <[Saint]> There's also the slight issue of a weather balloon not actually being able to *reach* spece. [3:14] <[Saint]> Depends on how you define "close". [3:15] <[Saint]> FergyA: the rocket car one is a good one. The sled on rails cut in half with the massive wedge is a LOT cooler, IMO. [3:15] <[Saint]> The thrust on that was AMAZING. [3:19] <diginet> are the RPi I2S drivers good enough for good quality audio yet? [3:22] <[Saint]> How accurate is the GPS? You could likely use that for the raspi tracking system as well, depending on the update rate and accuracy of the location data. [3:22] <[Saint]> It might flake out in the first few 100m or so. [3:22] <[Saint]> but eventually the camera would catch up. [3:23] <[Saint]> Well, that's not messing around. [3:23] <[Saint]> What motor is in this? Or was it a custom fuel mix? [3:24] * [Saint] is familiar with it. [3:24] <[Saint]> We're not allowed to play with anything that large here. [3:25] <[Saint]> Well, not without a LOT of consent. [3:26] <[Saint]> Oddly, last time I checked, we also aren't allowed to play with more than single stage rockets here either. [3:27] <[Saint]> I have seen many a multi-stage rocket end in tears. [3:27] <[Saint]> it is *sooooo* hard to get it right. [3:28] <[Saint]> The funniest one I saw was when the second stage misfired, about ~20m or so from the ground, on the way down. [3:28] <[Saint]> Burnt up the shoot and smashed itself into oblivion. [3:28] <[Saint]> It was *supposed* to be a recoverable capsule. [3:29] <[Saint]> The sdcard survived, which was the main thing. [3:31] <[Saint]> It is a wonderful combination of feelings, isn't it. You feel for the owner of the rocket, and everyone involved, as you know the time and effort and expense put into some of the large recoverable, multi-stage capsule type rockets. But, you're still like "Heh...that was *AWESOME*!" [5:37] <bity> im not saying, im just saying..
[6:11] <muhfiasbin> is there any possibilities to embed omxplayer to a webpage? [6:16] <muhfiasbin> any other option to embed omxplayer? [6:18] <ParkerR> muhfiasbin, What re you tryinig to achieve? [6:19] <muhfiasbin> I try it before with a HTML page..
[6:19] <ParkerR> muhfiasbin, Why does it have to embed on a webpage? [6:20] <ParkerR> Are you just wanting a video to play and loop? [6:21] <muhfiasbin> not just a looping vid..
[6:21] <muhfiasbin> I add picture slideshow and running text on it..
[6:31] <ParkerR> JakeSays, As bridges? [6:36] <ParkerR> Ok why three? [6:41] <JakeSays> ParkerR: so i use ddwrt as the repeater bridge? [6:42] <JakeSays> which means i dont need the 3rd one? [7:11] <JakeSays> ParkerR: ahhh! i believe that did the trick! thanks! [7:14] <BoomerET> I VNC in, and the remote VNC doens't use the whole screen, is it the conf file on the raspi most likely, is this common? [7:17] <ParkerR> BoomerET, Are you VNCing into an existing session? [7:19] <BoomerET> Start server, log in from remote pc. [7:20] <BoomerET> Let me see what I put in the config, I thought it was a 16x9, maybe I messed that up. [7:21] <BoomerET> I could have sworn I changed that. [7:25] <BoomerET> Problem solved, my apolgies for wasting all our time. [7:31] <BoomerET> I have a prototyping board for the Arduino from Sparkfun, it's quite nice. [7:41] <BoomerET> My biggest kick was hooking up an old usb wifi stick, and my PS3 move camera, and the stuff just plain worked. [7:44] <BoomerET> I did apt-get update, then upgrade, then installed Motion, plenty of tutorials around. [9:11] <user82> i guess this is valid for arch, too? [9:45] <linuxstb> bts__: You know that stdin is buffered by default - so you'll need to type something and press ENTER before the read() will read it? [9:51] <bts__> so I should somehow wait for input and then call the interrupt when it's ready? [9:51] <kieppie> I have a really silly question, but would it be even remotely conceivable to wire up the GPIO's to a RJ45 socket for network use? [9:55] <linuxstb> bts__: I've implemented my own non-buffered input (in C) for an app I'm developing for the Pi, but I think I'll change to use ncurses - it's just too messy to try and do it yourself. [9:57] <dash00> Hi, I'm trying to connect Kinect with raspberry pi, I've found few tutorials, but this (http://gremsi.blogspot.cz/2013/04/installing-openni-sensorkinect-and.html) seems quite good. But what's wrong, that I've got gcc error in compiling - http://pastebin.com/VDqpHh7q - some idea? [9:58] <gordonDrogon> kieppie, not really. [9:59] <gordonDrogon> yea, like that module - it's SPI based. [10:01] <Jck_true> On the upside you're gonna be a linux expert once you have implemented the full driver! [10:02] <gordonDrogon> I've a funny feeling there is a kernel driver for one of those SPI based modules, but I'd have to do a lot of digging to find out if it was the case..
[10:05] <gordonDrogon> I've not looked deeply into it, but I think some of the ones for the Arduino more or less have the entire stack inside the module, so the host just has a very high level interface to them. [10:05] <gordonDrogon> so the module itself responds to ping, etc. [10:07] <SpeedEvil> A linux box for a tenner, shipped. [10:09] <gordonDrogon> it's a bit short of RAM Though. [10:10] <SpeedEvil> True - but 32M isn't horribly limiting for many tasks. [10:11] <gordonDrogon> looks like it's actually designed to be a wireless access point - and not much else though. [10:25] <linuxstb> bts__: Doesn't C++ work the same as C? i.e. reading from stdin will be unbuffered there as well? [10:27] <gordonDrogon> use (n)curses for keyboard input.. it's so easy. [10:31] <gordonDrogon> you could setup the input stream to be unbuffered in c/c++ first, then call your asm routine. [10:33] <gordonDrogon> if you set it to non-blocking, then read will return immediately when no characters are ready. [10:42] <ShiftPlusOne> Kobzar, far from it, but if it works for you, then there's no reason not to use it. [11:57] <ShiftPlusOne> And not appropriate for this channel either. [11:59] <Kev-> I figured it's just text..
[12:00] <ShiftPlusOne> Not a big deal, imho, it wasn't over the top or vulgar, but some other ops may have a different view, so just giving a heads up on that. [12:01] <Kev-> I'll keep that in mind. [12:12] <ShorTie> i'm trying to compile some stuff in arch and keep getting 'error: unknown type name u_char' any idea's maybe ?? [12:28] <knoppies> ShorTie, thanks thats cool. I just have a bash script on my pi which can wakeup all my machines (I specify which one) and then SSH into the Pi. [12:29] <adeus> search/replace all u_char with "unsigned char"
[12:30] <ShorTie> could i be missing a gcc option maybe ?? [12:30] <ShorTie> more of a gentoo man, lol. [12:43] <ShorTie> add #define __USE_BSD ?? [12:48] <gbaman> anyone know how to drop the exposure down on the raspberry pi cam boards? [12:49] <ShorTie> hmmm, #ifdef __USE_BSD, isn't that remed out with the # in sys/types.h ?? [12:51] <ShorTie> i'm kinda lost programming since they did away with my fortran punch cards, lol. [12:53] <gordonDrogon> ShorTie, that's ok - you can write fortran on the Pi just fine! [12:56] <Mattz_m> good morning. Was wondering about building a RS232 I/O for my raspberry pi and was slightly confused about the wiring. Is it possible to have two ports with the connectors on the pi or would i need another board with suitable connectors to interface with it? [12:56] <linuxstb> chris_99: Yes ;) Your camera still not arrived? [13:01] <Mattz_m> mike_t: So it wouldn't be possible to have two separate connections of RS232 without them interfering with each other? [13:02] <linuxstb> chris_99: You ordered on 4th May? [13:06] <ShorTie> and another jions the club, lol. [13:09] <gordonDrogon> the Pi has one serial port - data pins only. There is a 2nd, and it is possible to reconfigure the on-board one as the 2nd one with control signals - but I don't think there is a driver for it. [13:10] <gordonDrogon> Bushmills, I know someone has tried to so a software uart on the Pi - without much success - too much jitter introduced by Linux to do the timing reliably. [13:11] <linuxstb> chris_99: You must be a good omen. [13:12] <ShorTie> anyone know of a good ping program ?? [13:13] <linuxstb> Err, "ping" ? [13:16] <Jck_true> Mattz_m: What about a port multiplexer? [13:23] <ShorTie> if i do 'char *pingpkg = "ping -c 3 192.168.1. ";' how could i step thru x and add it in ?? [13:26] <gordonDrogon> what programming language is that in ? [13:27] <gordonDrogon> char pingcmg  ; sprintf (pingcmd, ""ping -c 3 192.168.1.%d", num) ; ... etc. [13:31] <gordonDrogon> do youknow how you'll execute that command yet? [13:36] <ShorTie> i have these 22 ton feed bins scatard around the farm, trying to get a reading on them without have to manually go around and pound on them, lol. [13:39] <gordonDrogon> so each feed bin will have a Raspberry Pi on it? [13:40] <gordonDrogon> I've just connected a distance ping sensor up to a Pi too. seems good to to a few mm accuracy over 5mm to 4m. [13:42] <gordonDrogon> what do you farm? [13:45] <gordonDrogon> google for hc-sr04 - that's what I've just used. [13:48] <gordonDrogon> easy to program and interface. [13:48] <gordonDrogon> ozzzy, really? where are you? [13:49] <gordonDrogon> ozzzy, Hm. probably people keeping roosters when they don't need to. [13:49] <linuxstb> Dead or alive? [13:50] <ShorTie> Eat More Chicken! [13:51] <gordonDrogon> ShorTie, eating chicken is a special occasion for us - they're expensive... although not quite as expensive as nice steak. [13:51] <gordonDrogon> glad I live in an (almost) sensible place. [13:52] <SpeedEvil> linuxstb: you have removed the plastic tab from the front? [13:53] <SpeedEvil> There is a little plastic tab, with a protective film - over the front of the Pi camera. [13:53] <linuxstb> SpeedEvil: Thanks! I did that once with some cupboard doors - I nearly sent them back before realisng there was a protective film on them. [13:55] <linuxstb> SpeedEvil: I guess I should read the docs more carefully - thanks. [13:57] <tig|> has anyone had any joy in getting a reliable good quality video feed working with the pi-cam over wifi? [14:01] <linuxstb> With what command-line? Were you trying to re-encode it? [14:02] <linuxstb> If you're just passing through the video stream untouched, I would imagine vlc would be as good as gstreamer. [14:30] <gordonDrogon> the return code isn't the ping time though - it's just notification of success or not. [14:30] <gordonDrogon> of the ping command. [14:57] <cyp> do you have some recommendations for a hub ? [14:57] <cyp> or a model ? [14:58] <SpeedEvil> You need a powered hub, with a beefy power supply. [14:58] <SpeedEvil> How many is several? [15:49] <eephyne> could someone enlight me of why my pi keep telling me low memory on logs and at the same time i look into top and see only 154/461MB used ? [15:50] <linuxstb> eephyne: What exactly does the log say? [15:53] <BurtyB> eephyne, doesn't look like you have any swap enabled? [15:53] <eephyne> Should I ? [15:55] <x29a> eephyne: when is it happening? in idle? [15:55] <KanjiMonster> eephyne: looks like something needed to alloc > 32 kB contiguous memory and failed: "0*64kB 0*128kB 0*256kB 0*512kB 0*1024kB 0*2048kB 0*4096kB"
[15:56] <eephyne> x29a: what daemon running you mean ? [15:56] <eephyne> yes but why it fail KanjiMonster ? [15:56] <eephyne> hardware issue ? [15:57] <eephyne> I can solve this ? [16:00] <x29a> eephyne: can you tell us what you are doing? [16:00] <x29a> which primary application on which operating system? [16:00] <x29a> has it been running for a long time? [16:03] <nid0> what does a free -m show right now? [16:04] <esing> Which partition table should I use for my SD card? [16:05] <nid0> eephyne: have you messed with any settings in /etc/sysctl.conf? [16:06] <nid0> changed any settings to do with memory reservation? [16:07] <linuxstb> Anyone know why raspivid says "Preview window 0,0,1024,768" (instead of 0,0,1919,1079) ? [16:09] <linuxstb> It also says "Width 1920, Height 1080"
[16:42] <emzi> hi, Is there any list of (un)official sellers/retailers in different countries for Raspberry Pi? [16:45] <gryphraff> I have an event with about 400 attendees. 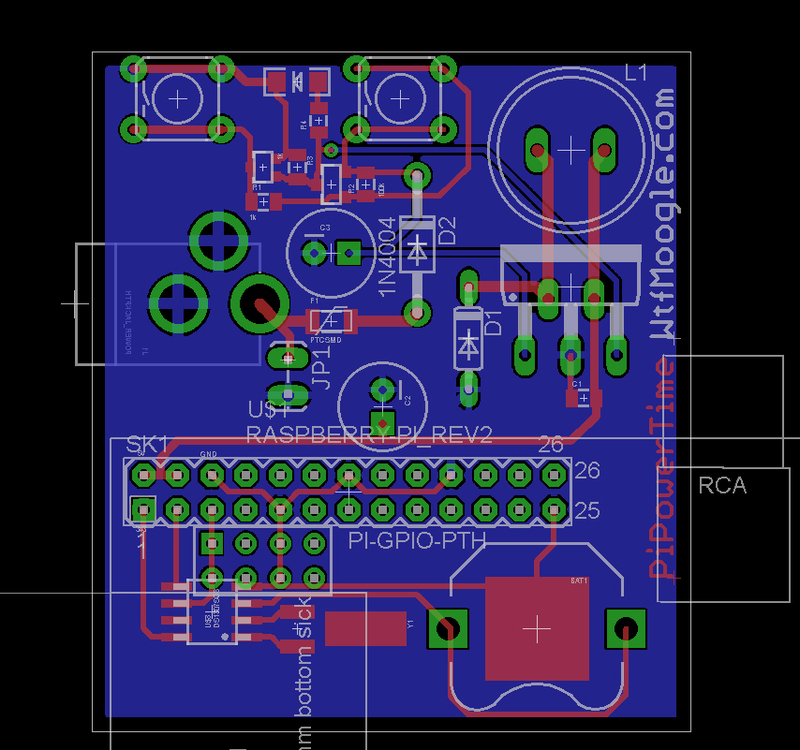 I was thinkin of setting up a Pi with something like phpbb as a local announcement board. Thoughts? [17:04] <maxinux> order from a diff vendor? [17:05] <gryphraff> Lucky enough to have a retail shop that sells them by me. I deal with MCM/Premier/etc as a business customer, so it gives me a bit more leverage. [17:54] <JakeSays> i tell ya - kids today have it MADE! [17:56] <JakeSays> when i was 10, i drooled over an 8bit single board computer that was about two feet long. couldnt have it tho because it was almost $500. [17:56] <JakeSays> i was in radio shack yesterday.. arduinos all over the place. [17:56] <JakeSays> and this pi thing.. sheesh! [17:57] <IT_Sean> That's what we call progress. [17:57] <gryphraff> Whoa whoa there, slow down parnder. My old Color Computer II can't keep up! [17:59] <JakeSays> SpeedEvil: hmm. interesting. [18:00] <JakeSays> nid0: when i finally got my first computer my grandfather exclaimed (quite loudly) "why in the f&#&* would anyone pay $1,000 for a TV and a typewriter??" [18:00] <nid0> did you tell him it (presumably) couldnt even do TV? [18:00] <IT_Sean> jaeckel: please mind your language. The channel condust policy is linked to in the topic. [18:01] <JakeSays> IT_Sean: i did watch it, and it was an exact quote. [18:05] <Chaz6> You can't say %$!@? [18:08] <Tachyon`> very important, certainly more important than actual abuse that goes on etc. [18:10] <user82> does anyone have a broken ntfs-3g in arch? Transport endpoint not connected? [18:22] <JakeSays> so i have a linksys EA4500 router that has a 1.2ghz arm processor. anybody ever built a kernel for a linksys router before? [19:02] <maxinux> can not be combined, not other discounts ? [19:03] <maxinux> you ordering from us store? [19:19] <ParkerR> "If you have a voucher code, enter it here and press APPLY before checkout"
[19:20] * linuxstb wants some more camera modules, but RS say out of stock until 19th August, and Farnell just says "out of stock"
[19:20] <IT_Sean> How may raspis do you have that you feel the need to add cameras to? [19:22] <IT_Sean> They will make more. You'll have your chance. [19:23] <laurent\> hi there, i see https://github.com/raspberrypi/firmware/commit/1c339b164613bae8b6a4cc0380c1a3dc25d83260 where can i read more about it ? would it possible to directly boot off an usb drive now ? [19:24] <komunista> please, need I allways shutdown the Raspi, vhen I am changing circiut connected to P1? Or will be enough only unplug the P1 connector while changing? [19:26] <arcanescu> linuxstb: ur camera arrived? [19:26] <linuxstb> arcanescu: Yes, this afternoon. [19:28] <arcanescu> linuxstb: :D awsome..... doing anything intresting? [19:30] <Redostrike> how much mp was the cam. [19:31] <IT_Sean> #raspberrypi is not google. [19:32] <ShiftPlusOne> ParkerR, what was the problem? [19:32] <IT_Sean> Redostrike: not 'till you sit, lie down, play dead, and stay. [19:33] <ShiftPlusOne> hm, no clue, sorry. [19:33] <ShiftPlusOne> laurent\, yes, the bootcode that lives on the chip cannot be altered, so it will always need at least one file on the sd card. [19:38] <ShiftPlusOne> ParkerR, not within X. I haven't tried it myself, so I can't talk much about it. Mogwai and djaz.z (dot to avoid pinging) are the people you might want to ask. [20:01] <ggVGd> I am using my pi with the Linksys wusb54gc dongle, and I am a max upload speed of pretty much exactly 1mb/s. is this normal? Afaik the dongle is 54mbs so it seems a bit low? [20:02] <ggVGd> connected to the wall socket so there should be enough power? [20:08] <ParkerR> ggVGd, LAN upload or internet upload? [21:17] <gryphraff> I'd settle for a fast dual core with oodles of RAM. [21:18] <gryphraff> Oodle is a technical term, BTW. It means "More than many but less than lots." [21:18] <IT_Sean> that anything like "a pufteenth" ? [21:40] <gadgetoid> I never thought I'd see the day when I would look at a Humble Indie Bundle and think: "I can't afford this"
[21:41] <TheArtist> Does anybody know if they will release (or not) Model C soon? [21:42] <gadgetoid> I didn't even know there would be a model C? [21:42] <gadgetoid> How much more could they pull off the Pi!… or add? [21:43] <Mortvert> gadgetoid, welcome to my reality. [21:43] <gryphraff> Potentially more RAM, but I think the current SOC limits that. [21:43] <gadgetoid> It's called the BeagleBone Black, ha! [21:45] <gadgetoid> IT_Sean: Not even a pink one!? [21:45] <IT_Sean> Not even a pink one, gadgetoid. [21:47] <gadgetoid> Oh for a cluster of rainbow Pi's! [21:47] <TheArtist> so i thought i could make an LFS for a PI! [21:47] <TheArtist> does it worth it? [21:47] <djazz> gadgetoid: yes! and PiBow! [21:47] <gadgetoid> gordonDrogon: addicted yet? [21:48] <gordonDrogon> gadgetoid, just weaned myself off. after getting 7000 on one level..
[21:48] <gordonDrogon> gadgetoid, serial TFT? [21:50] <gordonDrogon> gadgetoid, I did this recently: http://www.youtube.com/watch?v=JBtS35qPmeo still got to write it up. [21:51] <gadgetoid> gordonDrogon: Oooo, your monochrome clock looks better than my colour one! [22:14] <JakeSays> IT_Sean: i have to but only use one. 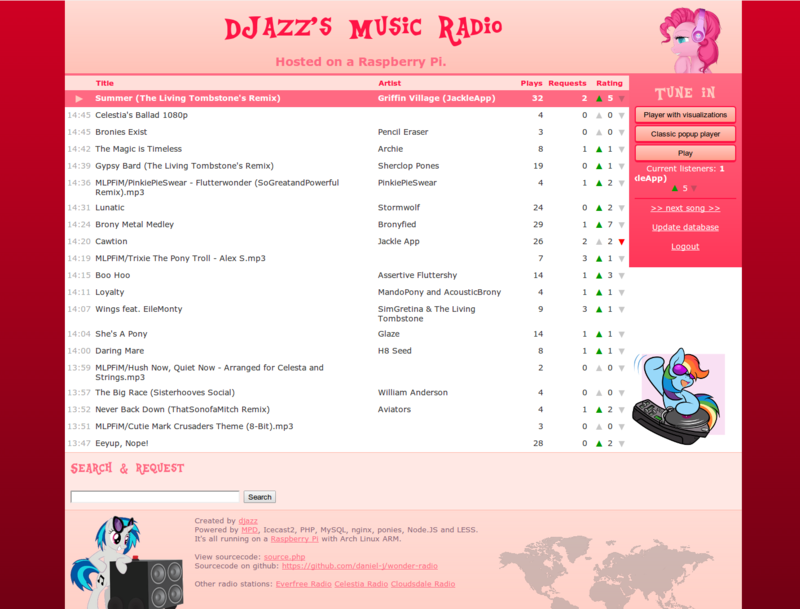 [22:15] <djazz> "no journal found"
[22:23] <djazz> is it safe to download a newer, unpublished, version of raspbian from raspberrypi.org? [22:31] <oldtopman> djazz: Would you happen to be in le america? [22:31] <Raspiman> Hi, does some1 know if WiringPi also support GPIO interrups? [22:32] <oldtopman> It's a huge copyright violation to run an unlicensed radio station, probably anywhere. [22:32] <djazz> on the web? [22:33] <oldtopman> On the web, irl, whatever. [22:33] <oldtopman> ShiftPlusOne: Probably not in that case. [22:34] <oldtopman> "made for free" != "legally allowed to broadcast"
[22:35] <oldtopman> Hey, I'm not here to argue legal semantics with you. Just trying to give you a heads up on the hornet's nest you're diving into. [22:36] * ShiftPlusOne watches oldtopman fly away. [22:36] <IT_Sean> djazz: you need to make sure, via creative commons licensing or whatever, that you have the artist's permission to rebroadcast. [22:42] <gordonDrogon> Raspiman, yes, it supports interrupts. [22:43] <Raspiman> Can i ask you a short question in private, so i dont spam the whole channel here? [22:53] <djazz> i ask again: is it safe to download a newer, unpublished, version of raspbian from raspberrypi.org? [22:58] <gadgetoid> ShiftPlusOne: Haha, that would be awesome! [22:59] <ShiftPlusOne> If the GPU was a bit more open, I could see it happening. [23:09] <ShiftPlusOne> True, but that wouldn't interest people as much. [23:15] <revele> is it possible that if you call a functin by reference that the delay() acts strange? [23:16] <gordonDrogon> revele, delay() is a wiringPi function (normally) - how are you calling it? [23:19] <gordonDrogon> it shouldn't fall short unless it's interrupted by a signal. [23:20] <gordonDrogon> but if your program doesn't use signals it should be fine. [23:20] <revele> what do you mean by signals. external interrupts? [23:20] <gordonDrogon> signals - internal interrupts. [23:21] <gordonDrogon> like pressing control-c on the keyboard and trapping the signal that generates. [23:21] <gordonDrogon> that's different though - that's not a signal in the Linux sense of things. [23:37] <gordonDrogon> your site's timing out on that image. [23:38] <Peemo856> Hello, I just bought a Raspberry Pi today and I'm having issues with my HDMI output.. I have put 2013-02-09-wheezy-raspbian on my SD card but when I boot up the device nothing happens on my TV. [23:39] <ShiftPlusOne> Peemo856, how did you put it on the card? [23:39] <gordonDrogon> can you ping/ssh into it? [23:39] <ShiftPlusOne> What happens to the LEDs on the pi when it powers up? [23:40] <Peemo856> I'm not sure how to ping or ssh into it. [23:40] <Peemo856> Which lights specifically? I think they all go the correct colour. [23:40] <gordonDrogon> NullMoogleCable, still failing to load that image. [23:41] <NullMoogleCable> really? no one else has a problem do they? [23:41] <ShiftPlusOne> all of them, which light up, which don't. Does the acct keep flashing quickly for a while and then stop? [23:42] <NullMoogleCable> thats odd... you use firefox? [23:42] <Peemo856> Orange, Green, Green, Red, Green. [23:43] <gordonDrogon> just tried chrom too - same thing - it gets halfway. [23:44] <Peemo856> The bottom on flashes for a while when stops yes, but in the end they are all lit up in this order Orange, Green, Green, Red, Green. Any thoughts? [23:44] <gordonDrogon> NullMoogleCable, are you putting mains (240v) directly onto that board? [23:47] <gordonDrogon> other pictures on your site are coming through fine. [23:49] <gordonDrogon> does a switch send signal via gpio? [23:50] <gordonDrogon> so you have to login to the pi & run a shutdown command? [23:51] <gordonDrogon> however - zed time for me -tomorrow! !